One of the most used â€œpassive devicesâ€ in an electric or electronic circuit is undoubtedly the resistor. Since it has wide range of applications they are found in different varieties. According to the type of resistance they offer, these devices are often classified as fixed or variable resistors. However, the resistors, either fixed or variable are not same in construction and hence are termed according to their type of construction. One of these resistor type is the carbon film resistor, which we would be discussed in this article. It is clear from the name â€œcarbon film resistorâ€ itself, that this resistor is made from carbon film. The carbon film is deposited on a ceramic former. This is actually a fixed type of resistor, meaning it provides only a single resistance value. Here the carbon film plays the role of resistive material that restricts the flow of current in a circuit. The figure below shows how a set of commercial carbon film resistors looks like. The accuracy of resistance value offered by this resistor owes to the helical cut that is usually made into the film. This and other construction features are discussed in the â€œconstructionâ€ section of the article. 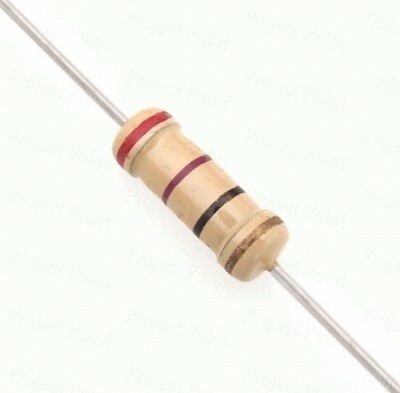 Now does this resistor have a particular symbol to represent it schematically, you may wonder. Actually, the symbol is same as that of a resistor, a zig- zag line or a rectangular box (IEC standard). However to differentiate that the used resistor in the circuit is a carbon film resistor, the resistance value of the resistor is prefixed by â€œCRâ€. Like for example, if we have used a 120kÎ© carbon film resistor, then we would write it as CR120kÎ©, to indicate the same. The carbon film resistors are constructed or manufactured using a deposition process. As mentioned earlier, a carbon film is deposited on a ceramic substrate. This carbon film restricts the flow and hence is the imperative part of this resistor. 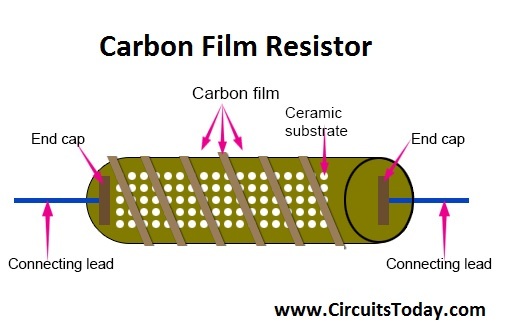 It is due to this reason, the resistor is named â€œcarbon film resistorâ€. A hydrocarbon such as methane or benzene is cracked at a high temperature of 1000oC where a ceramic carrier. Since a pure graphite(Carbon) is used for distribution on the ceramic substrate without binding the noise produced by the carbon film resistor is low. The role of ceramic substrate is that of an insulator to heat or electricity. Its presence therefore makes this resistor withstand high temperature without much damage. The figure below shows a schematic of the construction of the carbon resistor. Here we observe that the carbon film is helical in shape. As already mentioned it helps in getting accurate resistance out of this resistor. This helps in increasing the effective length of the resistor while decreasing the width of the resistor. The value of resistance is adjusted by increasing/decreasing the length of the helical path (since resistance is directly proportional to the length). An epoxy coat is given to the carbon film for its protection. The two end caps shown in figure are actually metallic and the two connecting leads made of copper are joined at the two ends of these metallic caps. So how does the carbon film layer help in restricting the electron flow? It actually depends on the width of the carbon film layer. For a high resistance value, a thin layer is chosen. As the width is less, there is less space for the free electrons to move. Similarly for a low resistance value, a thick layer is chosen. Since the width is more, there is more space for free electrons to flow; hence the restriction to the current flow is lesser than that with thin layer. Owing to the use of pure carbon, this resistor has a high negative temperature coefficient and lies in the range 2.5Ã—10^-4 Î©/Â°C and -8Ã—10^-4 Î©/Â°C. When carbon film resistors are compared with carbon composition resistors, the former has an advantage of lower noise. Also it has lower tolerance than carbon composition resistors. It is easy on pockets, as it is cheap in cost. It has a wide operating range and hence widely used. However, its high negative coefficient of resistance makes the resistance change easily with a change in temperature. An increase in temperature would decrease the resistance of this resistor, this is definitely a huge drawback. As we have already mentioned these resistors can withstand high temperature and high voltage, they find applications where these conditions need to be met. The operating temperatures can be up to 350oC and a voltage of 15kV. Application of carbon film resistors include high power supplies, X-rays, RADAR systems and laser. Carbon film resistors are those type of fixed resistors in which a carbon film is used for its resistive operation. Here deposition process is used for the construction and the carbon film which is usually cut in helical shape, is deposited on a ceramic substrate. This substrate acts as an insulator that helps withstand the resistor in high temperatures and high voltages. The width of the carbon film decides the value of resistance that is offered by this resistor. If the width is less, that is if a thin carbon film is used, a high value of resistance is offered by the resistor. Similarly, if a thick carbon film is used, the value of resistance of the resistor will be low. Also the helical shape of the carbon film can also be adjusted so that the effective length of the carbon film is changed according to the resistance value. The effective length is directly proportional to the resistance. Also, it has a high negative temperature coefficient which is also a major drawback of this resistor, owing to the use of pure carbon in its construction. Mostly these resistors are used in high temperature and high voltage applications like x-rays, laser high power supplies.